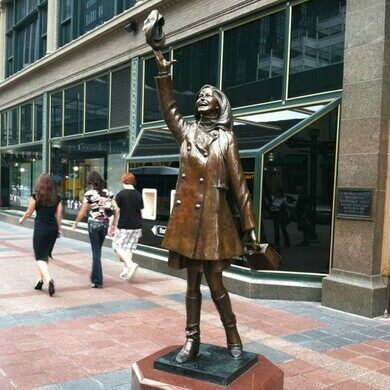 In downtown Minneapolis you’ll find a bronze statue honoring Mary Tyler Moore, or rather her character, Mary Richards, tossing her hat skyward in a jubilant expression of independent career-woman optimism. On The Mary Tyler Moore Show, the beloved actress played a young single television producer for a Minneapolis news station. Though the show was a sitcom, it took a head-on, modern approach to women’s liberation. The opening sequence ends with a freeze frame of Mary tossing her hat into the air, on the very downtown corner where the statue was erected in 2002. 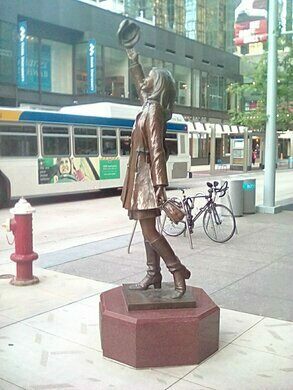 The statue—inscribed with the words of the show’s iconic theme song, “Who can turn the world on with her smile?”—was removed for sidewalk construction in 2015, and Minneapolitans were assured it would be kept safe in storage for the two years to come. Mary Tyler Moore fans in town and abroad expressed concern at not being able to see the beloved statue for such a long time. It was consequently put back on display in the nearby visitor center, and was returned to its sidewalk station in 2017. 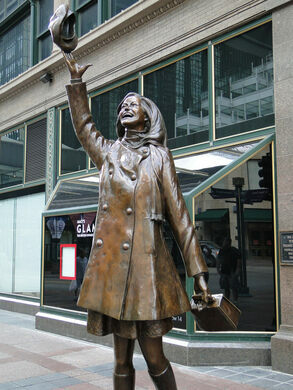 The statue is usually on display on Nicollet Mall at the corner of 7th Avenue. While sidewalk construction was ongoing it was housed in the Minneapolis Visitor Information Center down the street.